Considering visiting the Butterfly Park Cape Town? The entry fee for the year allows you to enter multiple times. The place is open from 9 am – 5pm, with the last tickets sold at 4:30pm. On the 24 of December, the opening times are 9 am – 2 pm. The don’t open on Christmas day. Fancy seeing some exotic creatures? The Butterfly Park Cape, which is actually known as Butterfly World Zoo is a destination to add to your itinerary. There are birds, reptiles, bearded dragons, lizards, hedgehogs and other creatures to be seen. The sanctuary is somewhat of a rescue project for animals that are unable to survive in their natural habitat. For some of these animals, it is a case of having been formerly domesticated. They would find it extremely difficult to fend for themselves if placed back into the wild. There is hardly anything novel about seeing animals in South Africa. What makes this place unique are the sort of animals you get to see. Instead of the usual BIG five that we often travel across the world to see, you encounter a different variety at this sanctuary. The name doesn’t quite fit the place. It has much more than butterflies for you to see. Perhaps it has outgrown its name. A possible explanation is that there may have been mainly butterfly when it started. There is a restaurant on the premises. This is a small way in which you can contribute to the incredible work that is carried out here. The food is delicious, and it is not extortionately priced. Due to the nature of the place, the waiting times tend to be fairly long during peak times. There is a skeleton exhibition, which is a massive draw for school trips. You are likely to run into one on most days that you visit, provided it is during a school term. There are safety features and accompanying signs. Daily animal shows during the school holidays. I have neither seen nor heard of any health and safety issues that have occurred here. They have taken a lot of precautions to ensure that visitors can come in and out safely. On a personal note, I would certainly struggle to be here with children. Perhaps that’s just me being overprotective. There is just something worrying about having a variety of creatures around a little explorer. As far as butterflies go, manage your expectations. There are a handful of species to be seen. You may even be more unlucky if it is not in season. The best part is the birds, in my opinion. If you live around, it is worth getting the annual ticket. 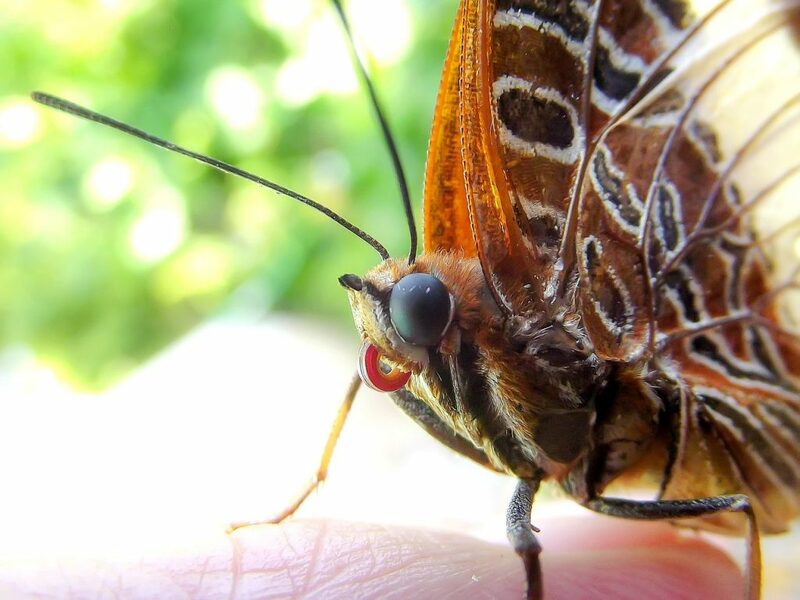 Butterflies are imported every few weeks from various parts of the world. For a one time visitor this may not mean much. However if you visit the place a few times over the year, you should be able to see a wide variety of butterflies. You will not struggle for parking, there is a massive car park. A lot of people have complained that they expected to see a lot of butterflies and were disappointed by there not being as many as they would have expected. This is not an opinion that I share. Although we came expecting butterflies, the fact that there were a lot more animals to be seen is a massive plus. Finally, do not miss the reptile demonstration. You get to get photos taken with pythons and other snakes. There was an amazing lady, who knew her way around these reptiles. Even that did not convince me to get close and personal with them. If you can manage it, please make sure you do not go on the hottest days. It can be very uncomfortable. We went on a hot day and on an average day, the difference is unbelievable. Perhaps the other side of the coin is that there are a lot less people when it is too hot.